Given that so much of our discussion and analysis goes to sires—leading sires, new sires, broodmare sires, undervalued sires—the March issue of MarketWatch is our opportunity to look more in depth at some of the top producers from the previous year. It's not that mares are any less important than stallions, but given the fact that they can produce far fewer foals in their lifetime than can stallions, broodmares are more challenging to study statistically on an individual basis. We typically group mares by their level of best race and best produce, but as a mare's accomplishments change, so does her value. One extreme example is MarketWatch broodmare of the year nominee Life Happened, who was unraced, not pregnant, and her only foal to race was a one-time winner when she sold for $4,500 to Machmer Hall Thoroughbreds at the 2008 Keeneland November sale. Earlier this year at Keeneland January, after three of her foals had won or placed in graded stakes and her ability to produce was known, Life Happened sold for $750,000 in foal to Harlan's Holiday. That sales price represented roughly a 15,000% return for Machmer Hall, who also sold three yearlings out of Life Happened for a combined $385,000. 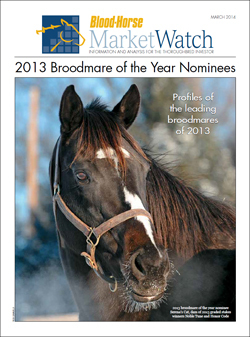 In the downloadable report we profile the 10 MarketWatch broodmare of the year nominees, including Life Happened. To be a candidate, a broodmare had to have produced a graded stakes winner in 2013 plus at least one other graded stakes winner in her career. The 10 finalists include eight grade I producers. Our writers this year include The Blood-Horse editorial staff members Eric Mitchell, Evan Hammonds, and Tom Hall, MarketWatch associate editor Nicole Sauer, and contributors Avalyn Hunter and Alan Porter. 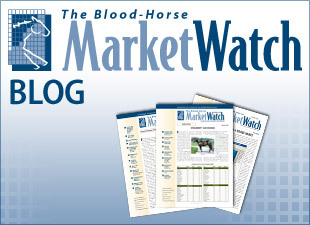 The MarketWatch broodmare of the year is determined by popular vote. After reading the profiles, please cast your vote below for the broodmare you feel most deserves this distinction. Voting closes April 13.